"GIVE THE GIFT OF CLEAR VISION AND CHANGE THE LIVES OF CHILDREN AND ADULTS IN NEED!" 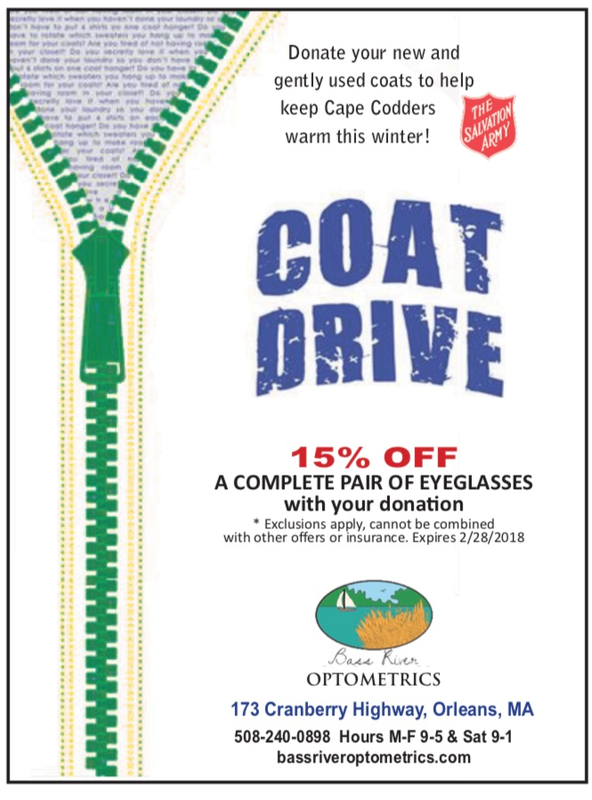 We are happy to announce that we are once again collecting coats to help keep Cape Codder’s warm this winter! 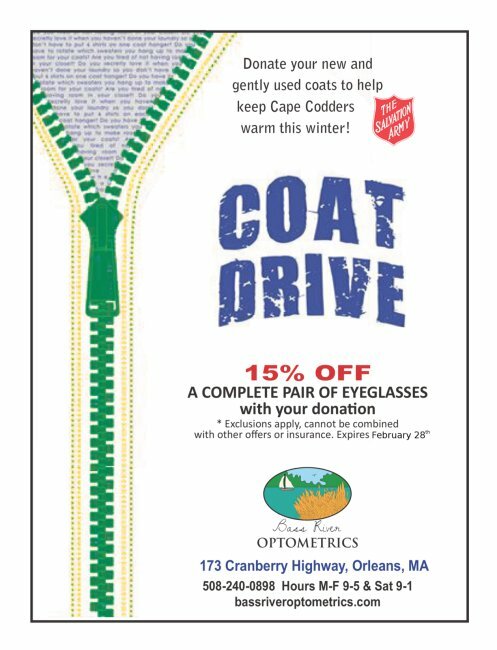 Please come by our office in Orleans to drop off a new or gently used coat (kids and adults) and receive a 15%* off a complete pair of eye glasses with your donation. *exclusions apply, cannot be combined with other offers or insurance. Expires 2/28/19. We are so impressed with the generosity of our patients, customers, friends and neighbors who went out of their way to stop by and make a donation to our annual coat drive this year. These 33 coats will be helping to keep those in need on Cape Cod warm this winter and next! We invite you to stop into our shop and donate an unwrapped toy to TOYS FOR TOTS and receive a special discount of 15% off your frames and lenses complete. Please note this discount cannot be combined with other offers or insurance plans. Ladies Night Out was a huge success last night! We had so much fun celebrating with you all and loved sharing some Maui Jim vibes with everyone. 😎 With so many leis and temps in the 70's, we felt like were transported straight to Hawaii. ☀️🌺🌴🌊 See you all next year! Our Back to School Special below is a great way to either update your child's glasses or get that extra pair so they can have one for school and one for play. We are accepting new patients and have availability in August to schedule your annual eye exam with one of our Optometrists. Please give us a call or stop in today to browse our large selection of frames or make an appointment. We look forward to seeing you! Ladies, call up your best friend and make plans to join us at Ladies Night Out on Thursday, October 26, 2017 at the Cape Codder Resort and Spa. 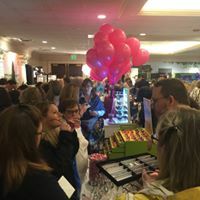 Enjoy an evening of socializing, shopping, music and sharing food and drink. Get pampered and learn about taking care of yourself first! 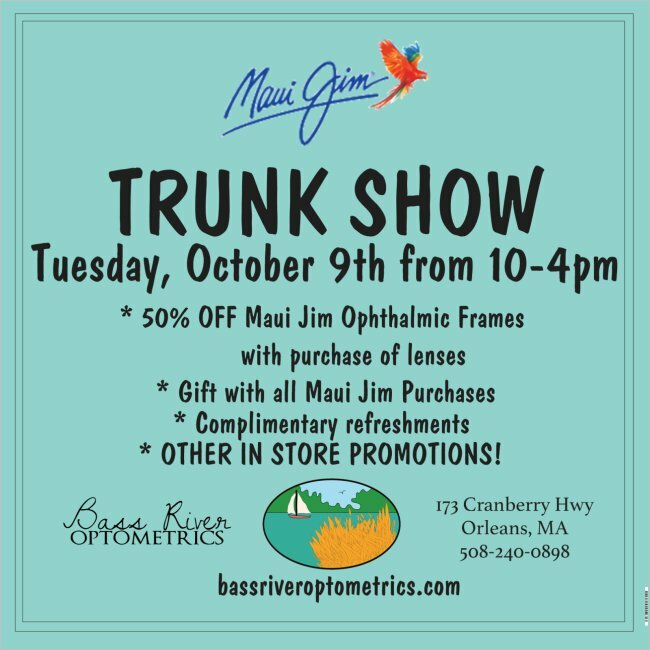 While your there, stop by and visit our booth to sample a variety of styles of designer eye wear, featuring Maui Jim Sunglasses, Eye Bob Readers and the Black Fin Ophthalmic Collection. Don't forget to sign up for our raffle for your chance to win a pair of glasses from our featured vendors. Visit www.gatehouselive.com/expos/Ino/capecod to purchase tickets to the event. We look forward to seeing you there!